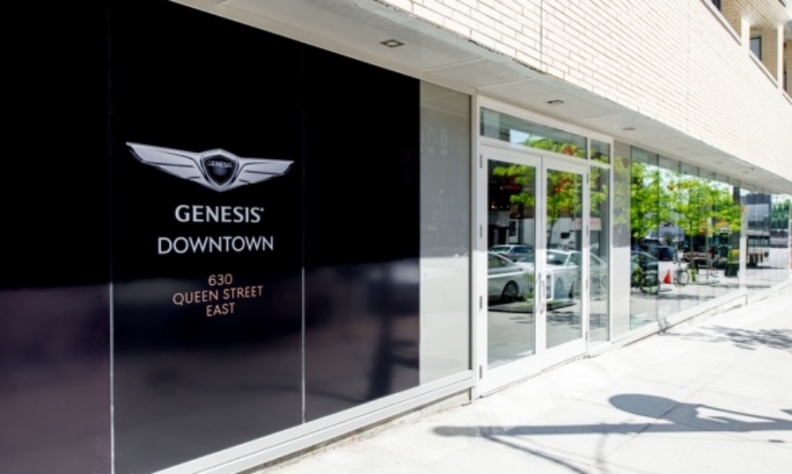 TORONTO – Genesis Motors Canada, Hyundai’s luxury brand, has opened its first Canadian retail storefront location on Toronto’s Queen Street. Genesis Downtown principal Shahin Alizadeh said the outlet provides another touchpoint for customers in addition to the Korean automaker’s online presence. “Since launch, our customers have expressed a desire to experience the brand in a more traditional automotive setting,” said Alizadeh. The store will enable customers to see and get information about Genesis models — currently G80 and G90 sedans — and to set up at-home demonstrations and test drives. Genesis plans to add three more boutiques and 30 additional stand-alone dealerships across Canada between 2017 and 2021, when it expects to have six models in its lineup. Until now, the “Genesis at Home” program had sales staff bring demo cars to the homes and workplaces of prospective buyers. Customers are able to complete the transaction online. After the sale, cars are picked up for service and returned to customers. The automaker’s plan has always been to develop boutique showrooms in select malls and downtown locations.